The web server used by Canecreekfarm.net is located in Provo, USA and is run by Unified Layer. This web server runs 5 other websites, their language is mostly english. 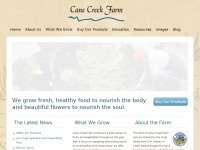 The Canecreekfarm.net websites were developed using the programming language PHP and served by a Nginx server. The website uses the shop software system WooCommerce XHTML 1.0 Transitional is used as markup language on the webpages. The website prohibits search engines and webcrawlers indexing the website. Other actions by webcrawlers and bots are allowed.